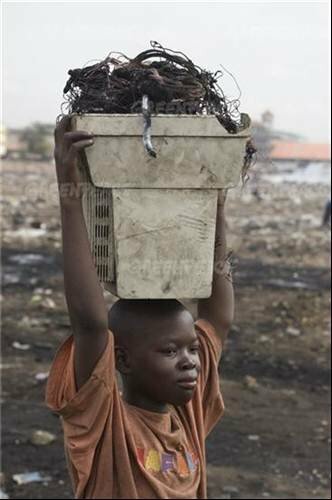 A boy carries copper wiring that has had the plastic melted from it in a small fire. This burning of electrical components releases toxic chemicals into the environment. Gangs of criminals, posing as computer recycling firms, are dumping hundreds of containers full of broken computer equipment in the developing world every week. Up to 900 containers a week are arriving in Africa and Asia from Western Europe and the US, according to e-waste experts. If you would like to comment on this story you can email the author Rebecca Thomson.